This stunning Koenigsegg Regera design needs to go into production pronto. Koenigsegg recently revealed its stunning purple-themed Regera designed in tribute to the late Prince. The catch? It wasn’t real, sadly. Instead, it was the first in an interesting series of fantasy design renders, where the Swedish supercar maker invites its employees to let their imaginations run wild and dream up their ideal Regera. The first design by the company’s Communication Manager Steven Wade certainly set the bar high, so how does this new effort by Sales Director Johan B compare? Johan’s design was inspired by French red wine, as reflected in the elegant color scheme, with a Bordaux-tinted carbon finish, a clear carbon center, and, of course, a gold leaf striping. “Johan has French roots,” Koenigsegg explained, “and the deep red finish will be like driving around in a glass of fine French red wine (with no blood-alcohol content, of course).” This wine-themed Regera retains the carbon fiber wheels fitted to the last design, but with grey wheels as opposed to white. The drink theme continues in the interior. Inside, Johan has opted for a cappucino/coffee color combination just to tickle your taste buds. It’s a more refined take on the Regera than the Prince tribute which makes us wish we could see it in colors other than the red or blue variants seen so far. 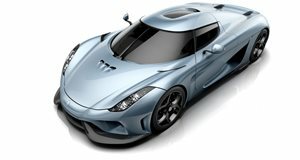 Fortunately, Koenigsegg has confirmed on Facebook that a configurator will be available for the Regera “in the not too distant future,” so we can at least dream up our own designs – especially as only 80 examples of this 1,500 horsepower monster are being built.